Walk-in tutoring for Undergraduate Physics courses (100- and 200-level) is normally available M–F each academic semester (Fall and Spring). Schedules are posted within the first two full weeks of the semester and students are encouraged to use this service. Space for this tutoring is in the UWM Golda Meir Library, 1 East, next to the PASS Tutoring. 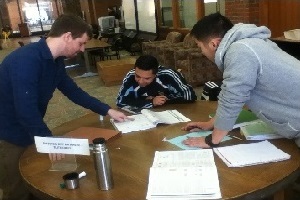 Tutoring schedules are posted in the library, as well as in various locations throughout the Physics building. The Spring 2018 Undergraduate Walk-In Tutoring Schedule is now available. Spring 2018 undergraduate physics tutoring will begin on Monday, January 29th, 2018 and continues through the last day of regular classes, Thursday, May 10th, 2018. The Panther Academic Support Services (PASS) also provides group and regularly scheduled tutoring for a number of courses. For detailed information, consult the PASS webpages.